Mr. 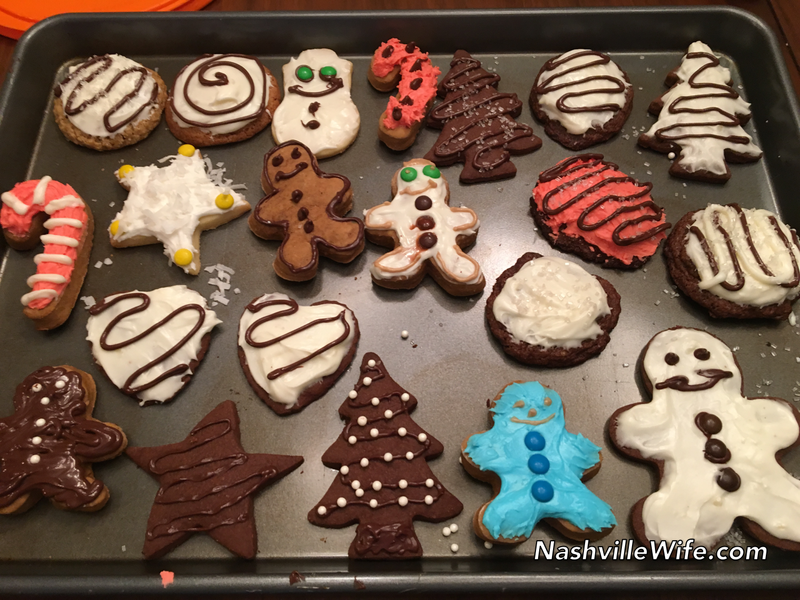 Handsome and I decorated a few batches, and I did another round of decorating with friends. Scroll down for pictures and tutorials. 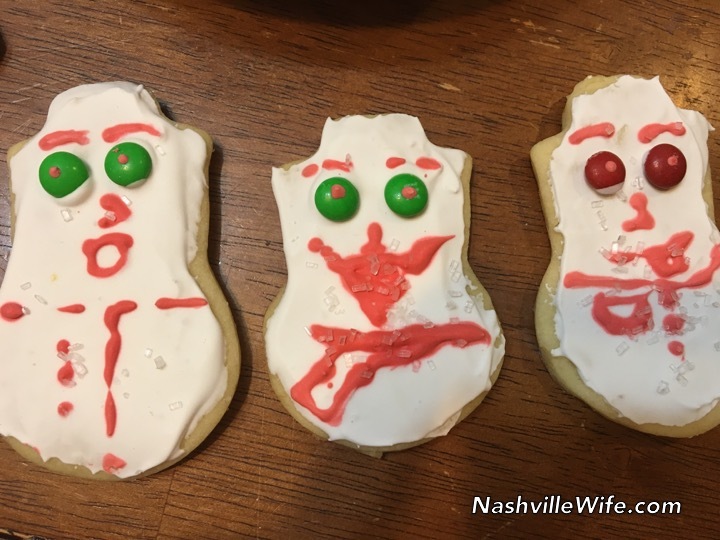 Do you enjoy decorating holiday cookies? 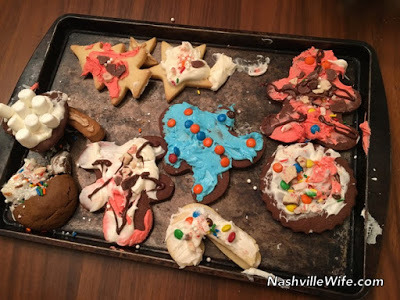 What types of cookies do you make, and how do you decorate them? Mix molasses, brown sugar, water, and butter until smooth. Cover dough tightly with plastic wrap, and refrigerate for 2 hours or more. Place cookies 2 inches apart on a lightly greased cookie sheet. Bake at 350F for 8 minutes. Cookies should be soft to the touch when you remove them from the oven. Place cookies on cooling rack. 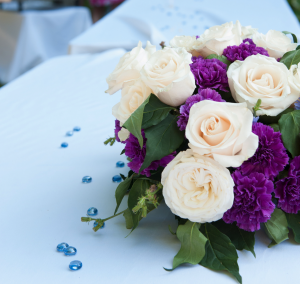 Allow to cool completely before decorating. The amount of cookies that this recipe makes varies greatly, depending on the size of the cookie cutters used. 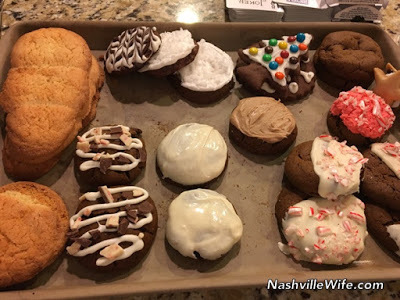 If small/medium cookie cutters are used (as shown in photo, which shows cookies sitting on a standard sized cookie sheet) recipe will make 4-6 dozen cookies. 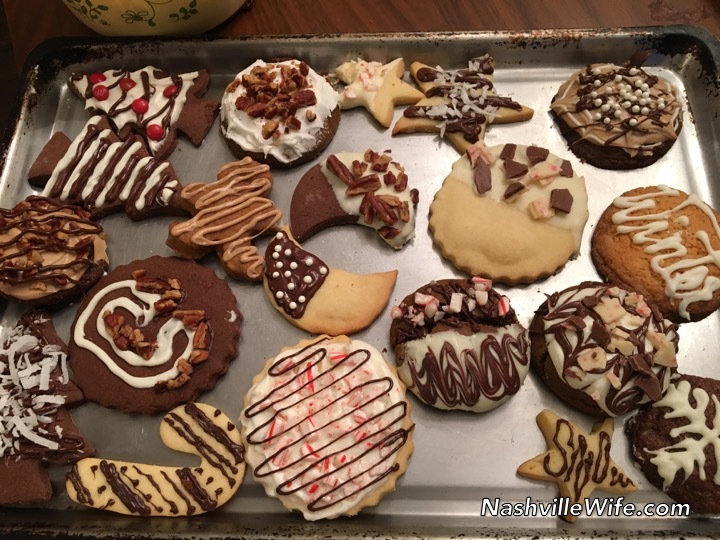 If large/x-large cookie cutters are used, recipe will make 2-3 dozen cookies. Combine 1 pound powdered sugar and 2 egg whites (use liquid pasteurized egg whites) in a large mixing bowl. 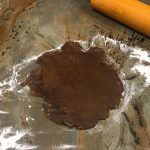 Using a hand mixer or standup mixer, beat until glossy. Slowly add lemon juice, and beat until icing is glossy and stiff (will use 2-6 Tablespoons of lemon juice). Add food coloring if desired. A few days later, I gathered with several ladies from our Bible study to decorate more cookies. 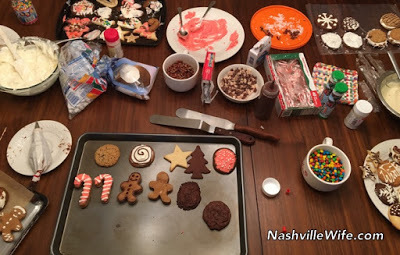 Everyone brought three dozen of their favorite type of cookie, as well as supplies for decorating. 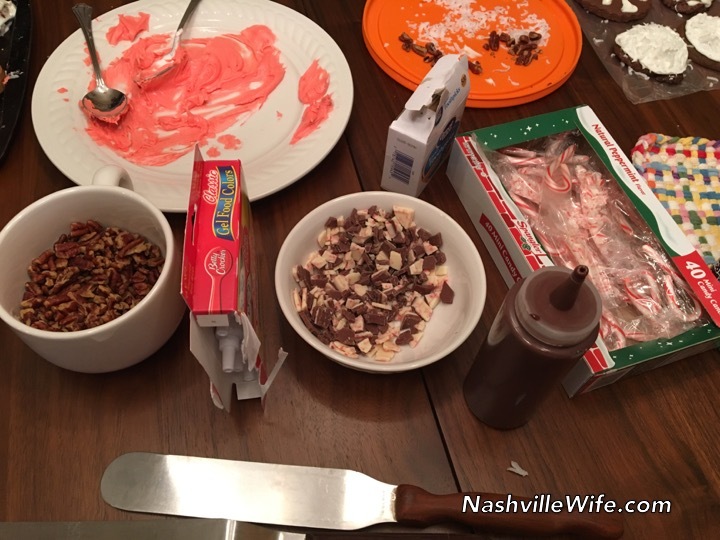 We had crushed candy canes, melted chocolate in squeeze containers, nuts, coconut flakes, and tons of sprinkles. I brought royal icing, and another gal brought cream cheese icing. It was a blast! 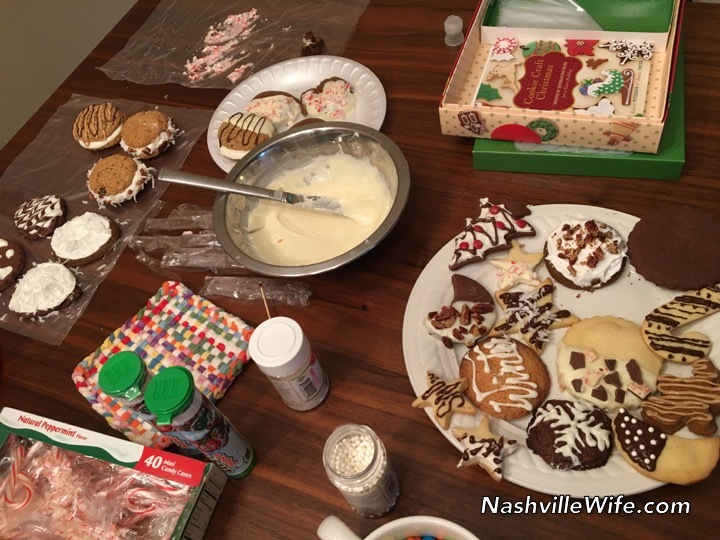 It's not recommended to use raw egg whites in royal icing recipes. Although the risk of salmonella is small, it is real. 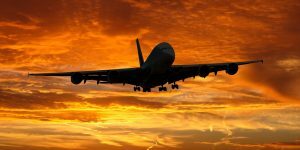 If something would happen, the young, the elderly, and anyone with health conditions can be in grave danger. Use either the pasteurized eggs that are on the market now, or commercial meringue powder. 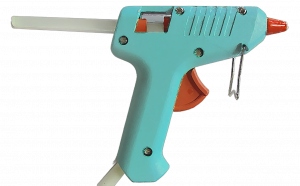 Wilton sells that, and you can find it at craft stores. The icing recipe will be on the back of the canister. You will hear lots of reports that people have used raw egg whites for decades and nothing happened. Or that the sugar content will take care of things. Or that once the icing is dried, it's safe. None of those are the best advice. The USDA still recommends safer practices when cooking with eggs. Raw eggs are also not recommended for pregnant women, so when the time comes, you will have to be careful with your icing! 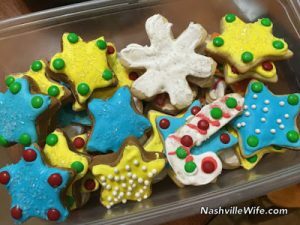 I developed quite a reputation for my Christmas cookies, back when I had the energy and health to work on them every year. I'd start in October, stashing finished batches in the freezer. It took a lot of work, nearly every weekend from then to December, along with several very long weekdays in the kitchen as December came. I think the most I ever produced at once were around 150 dozen cookies, or about 1800 individual cookies, maybe more. It was an expensive labor of love, to buy ingredients, run the oven, package, and ship. But my cookies were so popular, people would start asking me in the summer if they were still on my cookie list! I'd make several kinds of Spritz, gingerbread, sand tarts, caramel sand tarts, vanilla and chocolate sugar cookies, mocha-nut, raspberry swirl, Jan Hagel cookies, peanut butter indents filled with fudge, chocolate crinkles, chocolate-mint crinkles, brickle-chip cookies, butter cookies, cranberry-chocolate chip logs, and all sorts of other kinds I threw in from time to time. My criteria for a cookie to become a permanent part of my Christmas cookie recipe collection was that it had to be a little unique, it had to bake up "pretty," it had to be "dainty" (no cowboy-sized cookies for me), and it had to be a "well-behaved" dough. I had some trials and flops a few years, but enough tried-and-true recipes to see me through. Many of my recipes are from older (60's) women's magazines, when shortcuts and time-savers weren't so important to working women. 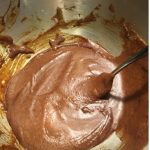 I have one recipe from my childhood that requires an old-fashioned hand-cranked metal meat grinder to grind the chocolate. No other device in the kitchen can duplicate that quality of grind and give the right texture to the chocolate. I have my great-grandmother's Lebkuchen recipe, in German, that requires baking ammonia and buckwheat honey. As far as decorating, I like to make cookies that bake up as is and require no frosting. I do pipe icing on the gingerbread. I often dip my cookies in or drizzle them with the special coating chocolate sold in the baking aisle, either the white or chocolate version. I'm sure it's not healthy for you, but it always performs so well. I insist on real chocolate sprinkles, bought online. I won't use the McCormick kind that are made out of who knows what and only look brown like chocolate. Big difference between those and the European-style true chocolate sprinkles. I've gotten pretty good with a pastry bag and can decorate that way, too. 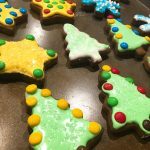 If you want to see some mind-blowingly beautiful cookies, check out the blog called "Bake at 350." 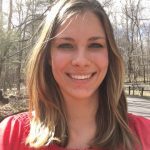 Her work is incredible. She inspired me for years. She has recipes there, but her decorated cookies are the stars of her show. Wow, what a blessing that must have been to all those who received your cookies. I can't imagine making 150 dozen cookies. You're an angel! I probably could have made more each year if I hadn't always run out of time. I used to be able to bake cookies all day. The hard part was stopping and cleaning up and switching right into making supper! I wouldn't be hungry after all that baking, but the rest of the family would be. Sometimes I'd feed them, and then go back to making cookies again that night, after everyone had cleared out of the kitchen. What breaks my heart now is remembering all the people I used to send cookies to who are no longer with us. So my message to all of you is to do things while you can. Time has a way of changing everything, not always for the better. Use today wisely. If you feel the urge to do something for someone, do it now. You'll be glad you did. Store those good memories to bank on later. And you thought this post was only going to be about cookies. There's so much more to baking at Christmas than what's on the plate…. Sounds like you worked hard. Thank you for sharing those words of encouragement. 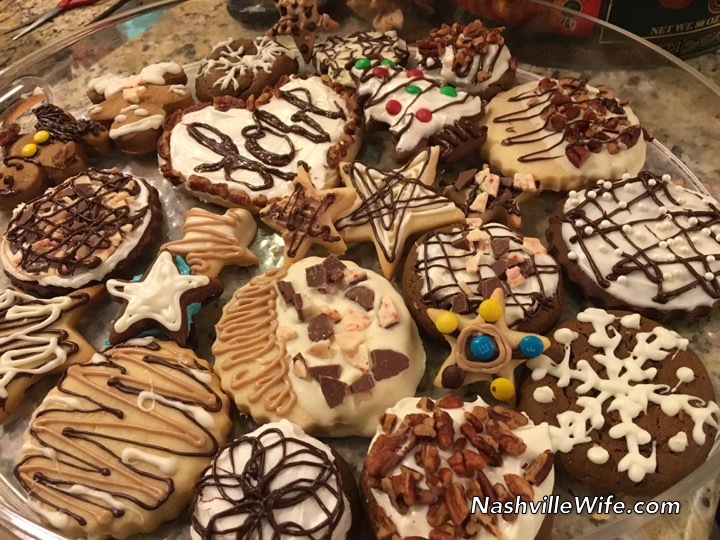 You are totally right that there is much more to Christmas baking than what's on the plate. You are a very wise woman! Meringue powder is a better option for royal icing as opposed to eggs. 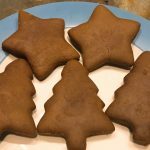 I use recipes for icing and sugar cookie dough from flourboxbakery.com. They also have great tutorials on YouTube. I'm curious, do you think meringue powder works better than eggs? Most stores sell liquid pasteurized egg whites (or even pasteurized eggs), which eliminates the risk of salmonella. Given the choice, I prefer the pasteurized whites. If those are not available, then the meringue powder. I have more predictable results using my own royal icing recipe and the pasteurized whites, not the recipe on the meringue package. But it is OK if you have to use that, just follow their directions to the letter. 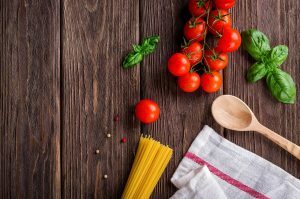 You can't always use your directions from your own recipe with their product. Hm, okay, I'm from Germany – home of gingerbread. 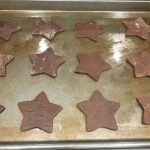 Real gingerbread cookies have to be baked in advance. At least a month before Christmas. Otherwise they are too hard to eat. While they rest you have to put an apple in the box so that they get soft. Sorry, I couldn't resist because I read the caption with gingerbread and thought: "Why? It's way too late for that!" Mom baked our Lebkuchen no later than Halloween. Stored them in a closed crock with a paper plate inside with pieces of bread or apple on it. Nobody touched them til Christmas! No egg in that recipe. Just honey and ground candied fruit and almonds and spices. Glazed with a thin glaze of sugar. Heaven We did not use the oblaten underneath. When I was 16, I had a boyfriend over at Christmas. He took one bite of the Lebkuchen and asked me where he could throw out the rest of it. I knew right then that he would never be marriage material, LOL! To be in my family, you had to embrace the German traditions and foods. The men in our family would always bend a lebkuchen before tasting it at Christmas dinner. If the cookie bent without breaking it was ready to eat. If it broke in half it was made too late. They made quite a show of testing the lebkuchen. This post brought back good memories! It was a 2-day process to make it. You mixed the dough one day and it had to rest 24 hours in the fridge before you rolled it and baked it. Then it got glazed and stored in the crock til Christmas. I will admit to sneaking a few a little early when I lifted the lid to change the bread or apple slices. I couldn't wait! But it was definitely better when aged at least a full month. 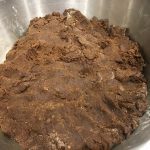 Hardest part of making Lebkuchen (other than waiting a month to eat it) was finding candied citron so early in the season, and getting ammonia carbonate, the leavening agent in the old recipe. We used to get it from a pharmacist but you can now get it online. It's called "baking ammonia," but it's also known by the old name hartshorn. And true to its name, the smell is powerful. When it hits the hot honey in the pot, you don't want to be standing over the fumes. But they do die down and no ammonia flavor remains when the cookies are baked. It produces a slightly different leavening action than other things like baking soda or baking powder. Most often, you will find it called for in older recipes, particularly the German cookie recipes. They were nice. A note: I got a virus warning while using this site on Firefox but was told by one of the sisters that the best browser to use is Google Chrome. (They'd had their site checked and no problems found). I've had no problems on Chrome. Today I'm baking a Winter Wonderland white chocolate cake for Christmas. I'm using the recipe from a magazine but if anyone's interested I'll see if I can find it online. (It's by the British YouTuber/blogger Tanya Burr).